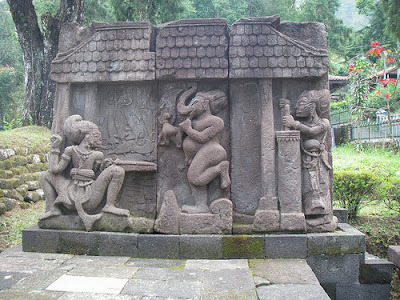 One of the Javanese Hindu temples, Sukuh was built on the northwest slopes of Mount Lawu during the 15th century, at an altitude of around 1186 meters above sea level on the border between Central and East Java. Unlike many other temples, the existence of Sukuh temple is not known to many. It is one of the several temples built when the Javanese religion and art had diverged from Indian precepts and was the last significant area of the temple in Java before the conversion to Islam in the 16th century. It was difficult for historians to interpret the significance of the antiquities due to lack of records of Javanese ceremonies and beliefs of that era and the distinctiveness of the temple. It could probably be due to its location, hidden on the slopes of Lawu Mountain at a height of more than a thousand meters above sea level. This temple is considered to be controversial due to its shape which is very much different from other temples and one can reach it from Karanganyar which is about 20 km from the temple and 36 km from Surakarta. Its main structure is unlike any ancient edifice and it is a type of a truncated pyramid similar to Maya monument which is surrounded by monoliths with skillfully carved life sized statues and the impression gained from it is very much different from that of other major temples in Central Java such as Borobudur and Prambanan. The relics of the temple appear to be the same like the Mayans in Mexico or Peru Inca cultural heritage. Since it was built after the Hindu religion had weakened, it does not follow the Hindu architecture, Wastu Vidya. The temple instead of a rectangular or a square shape is a trapezium with three terraces, with one terrace higher than the other and a stone staircase rising from the front area of the pyramid to ascent to the top. It represented a mountain and it is unknown as to what was its intended symbol with its unique shape. Moreover there is no evidence that the main building was supported by a wooden structure while the only object recovered was a 1.82 meter, lingga statue bearing an inscription which is now in the custody of the National Museum of Indonesia. 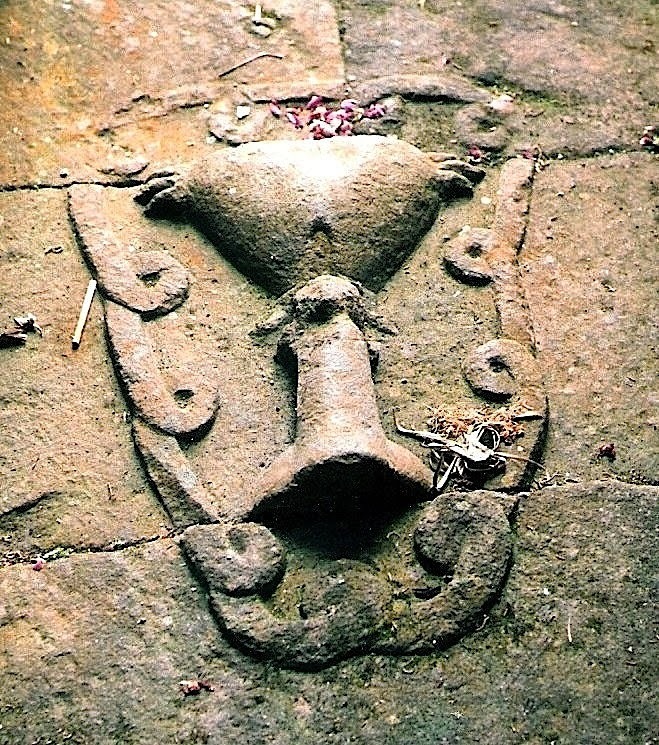 It is presumed that the statue could have stood on the platform over the stairway and has an inscription carved from top to bottom which represents a vein with a chronogram date similar to 1440. Three stone alters in the form of enormous turtles stand around the pyramid’s western foot while the central pyramid is set at the rear of the highest of the three terraces. The worshippers earlier gained access to the site from the gateway towards the edge of the western or lowest terrace. Towards the left side of the gate’s exterior is a carving of a monster devouring a man, birds in a tree and a dog which is presumed to be a chronogram representing 1437 CE and could be the likely date of the consecration of the temple while the inscription on translation, relates Consecration of the Holy Ganges. Besides this the wall of the main monument portrays two men forging a weapon with a smithy along with a dancing figure of Ganesha which is one of the most important Tantric deity with the body of a human and the head of an elephant. According to the Hindu Java mythology, the smith is believed to possess not only the skill to alter metals but also the key to spiritual transcendence which drew their power to forge a kris from the god of fire. The smithy was also considered to be a shrine and the Hindu Java kingship at times were empowered and legitimated by the possession of a kris. The temple which was built in a shape symbolizing Meru Mountain was built during the 15th century just years before the fall of the Majapahit Empire. Many are speculating on the possibility of two different tribes in two different continents in building the same shape and architecture or was there any influence from Mayan in the process of construction of the temple? Several theories have come up with regards to this issue where one relates that the Sukuh temple was built in time when Hindu cultures diminished, resulting in it being built using the concept back of the pre historic Megalithic culture. 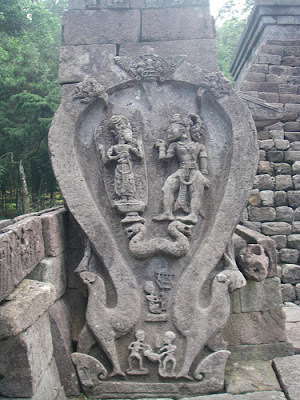 Some other theory states that the temple’s shape was a part of finding Tirta Amerta or the eternal life water, a story from the book of Adiparwa and the first sequel of the Mahabharata and a cut pyramid symbolizes Mandaragiri which was cut to swirl the ocean and those looking for eternal life could drink from it. During his reign in 1811 to 1816, Sir Thomas Ruffles the ruler of Java in the year 1815, visited the temple and found it to be in bad shape. He observed many statues were thrown down and several of them were decapitated. 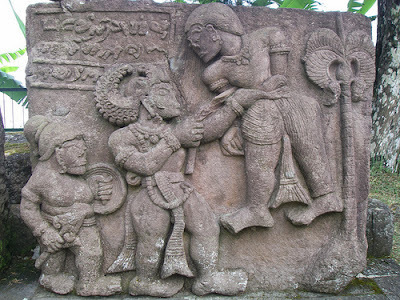 The giant statue lingga was broken into two parts which was then shaped together and this vandalism of culture was presumed to be an effect of the Islamic invasion of Java during the 16th century based on some identical patterns found in all other Islamic and monotheistic invasions in general.